Dr Jengo's World: Playstation Plus' Vote-to-Play Details for September! 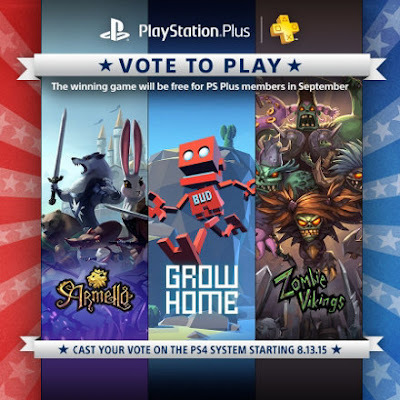 Playstation Plus' Vote-to-Play Details for September! Playstation is giving us the chance to vote for 1 of our monthly free games for being a PS Plus Suscriber in this new Vote-to-Play feature! games to pick from and we even get "Vote-for-me" videos from each of the games..
Hmm.. I'll be voting for Zombie Vikings as it looks like it has a very similar play-style to Castle Crashers. Of the 3, this is the only one that interests me and probably will only download the free game if Zombie Vikings wins. Co-op sidescrollers are always enjoyable with a group of friends so maybe you will vote together with me? "If you’re a PS Plus member and want to cast your vote, simply log on to your PS4 with your SEN account and you’ll find the Vote to Play link under “What’s New,” “Notifications” or in PlayStation Store when voting begins. And don’t worry if you change your mind. Simply log back in and change your vote – it’s as simple as that!" Apparently, we will not get to Vote every month for our free game and it's only going to happen periodically, at least for now.. I do like the idea of having a say in what games we get each month. Definitely a Plus to be a PS Plus member! - Aug 13 4.30pm BST to ? - Aug 13 5.30pm CEST to ? Will update again when there's confirmation about Asia PS Plus.